I found out the red, stingy face way that I'm allergic to a preservative called hydroxybenzoates. I loved my Neutrogena Oil Free range the past few years but all of a sudden my face tingled whenever I use it. I don't know if it's the new formula or whether my skin has gotten sensitive over time from my Oratane acne meds. Being a bit dopey, I thought the redness in my skin was from being generally hot and sweaty after blow drying my hair. But no, it was my skin reacting to the moisturiser. I eventually figured it out so I've been looking for a new oil-free, non-comedogenic face moisturiser with SPF that won't cause my acne to break out. I tried and really like The Body Shop oil free mattifying seaweed moisturising lotion with SPF 15, but I don't like my face enough to spend $25.95 on 50ml. Sorry face, I'm too stingy. 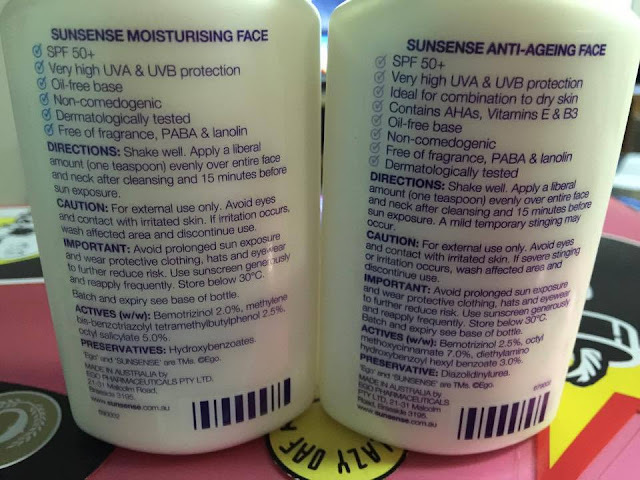 A friend recommended Sunsense moisturising face for about $10 for 100ml. I gave it a go and my face stung worse than before, which is when she told me her boyfriend reacts to the moisturising face one as well, but is fine with the anti-ageing version. I'm still in denial about getting old and was all 'nuh, I'm early 30s - anti-ageing is for old people' and I'm not entirely sure what the anti-ageing element is of the formula.. a bunch of AHAs and vitamins according to the label, but mainly I just wanted Sunsense's high SPF for better sun protection so I tried the anti-ageing version. In my current job, I drive 40-60mins in morning sun to get to work and have the 'trucker's arm" tan to prove it. I'm all about SPF right now. 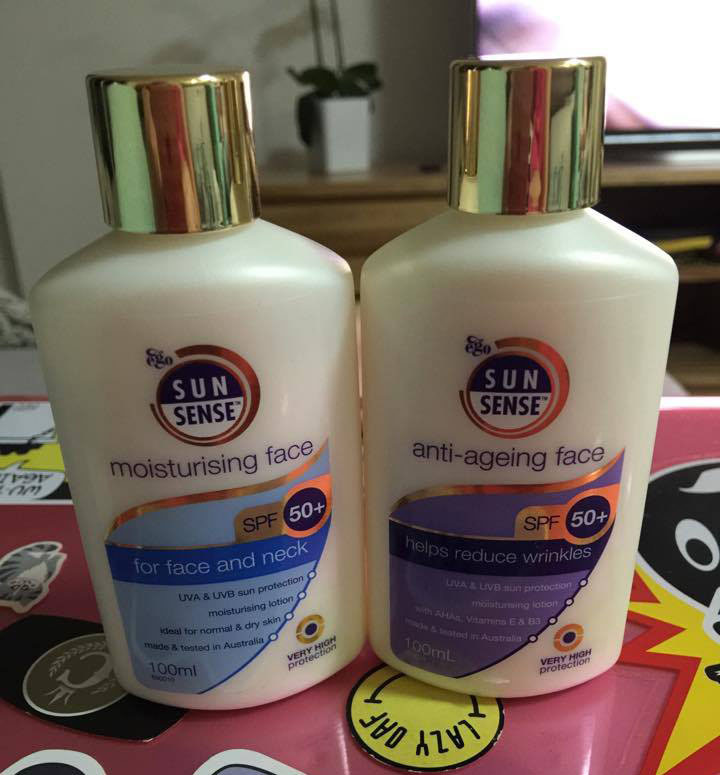 The Sunsense Anti-ageing moisturising version (purple bottle) is my new favourite face moisturiser. No sting, much SPF and really good moisture - my skin normally feels tight if I only use a sunscreen but Sunsense have packed decent moisturising ingredients into their formula. The anti-ageing bottle uses a different preservative to the regular one so I don't get a red faced sting when I apply it. Strangely enough, the anti-ageing bottle warns that a mild sting may occur, but the regular one that actually did sting me doesn't. Guess like with all body products you need to test it to see how you react (Chemist Warehouse usually have test bottles that you can try before you buy). The Sunsense moisturising face range doesn't leave my skin feeling tight or dry all day. If the blue one doesn't sting you, then I'd recommend that since it's cheaper and feels the same as the more expensive anti-ageing version. The anti-ageing version retails for about $20 for the 100ml bottle. There's a matte finish, tinted regular version and anti-ageing version too but I avoid tinted anything because my neck is short so my face gets stains all over my clothes if I wear make-up or tinted moisturiser. But if tinting and make-up is your thang those are good options too. The Sunsense range seems to have every base covered.